For fossil taxa, see text. 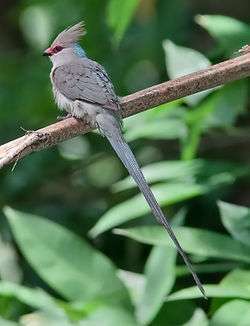 They are slender greyish or brown birds with soft, hairlike body feathers. They are typically about 10 cm in body length, with a long, thin tail a further 20–24 cm in length, and weigh 45–55 grams. They are arboreal and scurry through the leaves like rodents, in search of berries, fruit and buds. This habit, and their legs, gives rise to the group's English name. They are acrobatic, and can feed upside down. All species have strong claws and reversible outer toes (pamprodactyl feet). They also have crests and stubby bills. The mousebirds could be considered "living fossils" as the 6 species extant today are merely the survivors of a lineage that was massively more diverse in the late Paleogene and Miocene. There are comparatively abundant fossils of Coliiformes, but it has not been easy to assemble a robust phylogeny. The family is documented to exist from the Early Eocene onwards; by the Late Eocene or earlier, two families are known to have existed, the extant Coliidae and the longer-billed prehistorically extinct Sandcoleidae. The latter were previously a separate order, but eventually it was realized that they had come to group ancestral Coraciiformes, the actual sandcoleids and forms like Neanis together in a paraphyletic assemblage. Even though the sandcoleids are now assumed to be monophyletic following the removal of these taxa, many forms cannot be conclusively assigned to one family or the other. The genus Selmes, for example, is probably a coliid, but only distantly related to the modern genera. Genus †Eobucco brodkorbi Feduccia & Martin 1976 - sandcoleid? Genus †Uintornis Marsh 1872 - sandcoleid? Genus †Chascacocolius Houde & Olson 1992 (Late Paleocene ?- Early Eocene) - basal? sandcoleid? The only known species of Necrornis (Milne-Edwards, 1871) (Middle Miocene of Sansan, La Grive-Saint-Alban, France) was redescribed by Peter Ballmann as Colius palustris in 1969. This treatment was approved by Olson in 1985. ↑ Jarvis, E. D.; Mirarab, S.; Aberer, A. J.; et al. (2014). "Whole-genome analyses resolve early branches in the tree of life of modern birds". Science. 346 (6215): 1320–1331. doi:10.1126/science.1253451. PMC 4405904 . PMID 25504713. ↑ This is not a typographical error, but a Latinization of Sand Coulee River, where some fossils of Sandcoleus where found. In spoken English, "Coliidae" and "-coleidae" sounds very similar. ↑ It has a peculiar foot morphology not found in any other bird, with very stubby toes. The specific name absurdipes ("absurd foot") refers to this. The genus name is an anagram of "Messel", where it was first found. ↑ Mikko's Phylogeny Archive Haaramo, Mikko (2007). "Aves [Avialae]– basal birds". Retrieved 30 December 2015. ↑ Paleofile.com (net, info) . "Aves". Retrieved 30 December 2015. ↑ Peter Ballmann (1969): Les oiseaux miocènes de La Grive-Saint-Alban (Isère). – Géobios 2: p 157-204. Hackett, S.; et al. (2008). "A Phylogenomic Study of Birds Reveals Their Evolutionary History". Science. 320 (5884): 1763–1768. doi:10.1126/science.1157704. PMID 18583609. Houde, Peter; Olson, Storrs L. (1992). "A radiation of coly-like birds from the Eocene of North America (Aves: Sandcoleiformes, new order)" (PDF). Natural History Museum of Los Angeles County Science Series. 36: 137–160. Mayr, Gerald; Mourer-Chauviré, Cécile (1999). "Unusual tarsometatarsus of a mousebird from the Paleogene of France and the relationships of Selmes Peters, 1999" (PDF). J. Vertebr. Paleontol. 24 (2): 366–372. McCormack, J.E. et al. (2012) A phylogeny of birds based on over 1,500 loci collected by target enrichment and high-throughput sequencing.